In this tutorial, we will discuss the maximum distance that a fiber cable can transmit without an amplifier or repeater. This distance is limited by the fiber’s attenuation (loss) and dispersion (pulse widening). In practice, fiber link distance can be extended by using fiber amplifiers and dispersion compensators. where hv is the energy of each received photon. 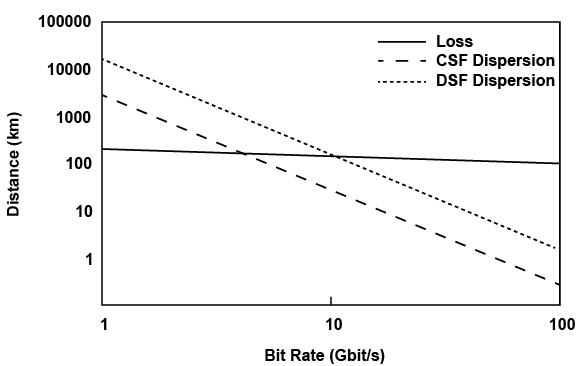 Note that the maximum loss-limited fiber length decreases with increased data rate B.
OK. Let’s look at an example to further clarify this concept. Consider a fiber link operating at 1300nm with a fiber loss of α = 0.4 dB/km. The input optical power is 1 mW and the minimum number of photons per bit of information Np is 1000. If the data rate is 2.5 Gbit/s, what is the maximum fiber length limited by fiber attenuation? Optical pulse widening due to fiber dispersion is the other important limit on optical fiber’s maximum span distance without an amplifier. The result of pulse widening is overlap between adjacent pulses, and this overlap causes increased detection error on the receiver side. where T is the digital bit time duration. We can change the above equation to expression of data bit rate B, where B = 1/T. where D is the dispersion coefficient, L is the fiber length, and △λ is the spectral width of the light source. This means that at 2.5 Gb/s, the maximum distance is 100 km with no amplifier. This means at 2.5 Gb/s, the maximum distance is only 6 km. For a single frequency single mode laser, the spectral width is also much larger than the inherent source spectral width due to digital modulation. Note that in this case, doubling the data rate B would reduce the maximum length L by a factor of 4. So, at 2.5 Gbit/s, L ≤ 7040 km, at 10 Gbit/s, L ≤ 440km. So, at B = 2.5 Gbit/s, we have L ≤ 440 km, and at B = 10 Gbit/s, we have L ≤ 27.5 km. We can see the limitation set by fiber dispersion. The following graph shows the maximum fiber length limited by pulse dispersion as well as fiber attenuation in single mode fiber.